Welcome to the first edition of Secrets Exposed. This week we are pleased to feature Professor Charles Xavier, known to many as Professor X. 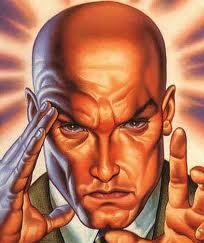 Professor Xavier is best known for running a school for mutants and for heading up the X-Men task force. As Charles is about to retire soon, he's decided that it's time to come clean on some things. TNR: Charles, thank you for coming today. Xavier: Thank you. I've been burdened with these secrets for far too long. TNR: Would you like to just dive into it than? Xavier: Absolutely. As you know, I'm considered to be one of the most powerful mutants. TNR: Indeed, your fame far precedes you. Xavier: Well, that's the lie. Xavier: I'm not actually a mutant. TNR: What? That can't possibly be. How do you explain your powers? Xavier: I don't have any. I was a homeless guy living on the streets of New York and I figured a good con. I had no idea it would ever last this long. TNR: So you're telling me you faked having telepathy? Xavier: I know what you're thinking. Shouldn't I have been caught before? TNR: That is exactly what I was thinking! Xavier: I've been at this a long time. Fact is, it got easier the more famous I got. Soon enough mutants that actually had telepathy were beaming into my head because they assumed I would hear them. They had no idea it was them all along. Xavier: Heck, I didn't even graduate from college. The whole Harvard thing... I made it up. You'd be surprised how little fact checking people do when they think you're all powerful. TNR: But you built that device to tune you in to other mutants globally. Xavier: Actually, if you paid attention you'd remember that I had Magneto help me. That dude is way clever. Wicked cool device too. Actually simulates what it's like to have low level telepathy. TNR: But you've trained so many students at your academy. Xavier: Yeah well, you know what they say. Xavier: Those who can't, teach. TNR: Amazing. Charles thank you for your honesty today. Quite the bombshell. Until next time, we'll keep your secrets. A great post for X. Funny stuff. Love your interview format. you have shattered my world. I bet he wasn't crippled either. Reminds me how I never had to show my engineering degree to anyone. I think I dated this guy in college. Haha! Just please tell me the accent is real! At least that! I'm so disillusioned right now. Well, as long as Wolverine is legit-- we're good. Sigh. I think the biggest surprise is that he's still single. Grrrrr. Wow! In one evil swoop you retconed Professor X. Amazing!!! Those who can't, teach.....lol....one of my hubby's favorite lines! how is he still single? Dude, is it just me or is honesty in older men a total turn-on? Too bad he is sporting the chrome dome, other than that, he had me at Harvard.